From the moment you started thinking about buying a house, you knew you’d need to start saving. Even though you have a 401(k) that you can use for your down payment, you still have to cover your closing costs and have a little extra put back in case something goes sideways on you right away. Unexpected home repairs are terrifying when there’s nothing in the bank and no home equity to draw from yet. But it doesn’t have to be all doom and gloom. It’s actually easier than ever to save up for a closing day that’s a bit down the road. So, you’ve probably read plenty about budgeting by now, and that’s awesome. If you haven’t, the basic summary is this: you want to sit down and decide how much money you can spend in various categories like rent, utilities, food and so forth. Almost no one gets this right or sticks to their budget because they’re lying to themselves. They say they want to spend less money on take-out, but they don’t, not really. They don’t want to stop seeing a movie every weekend. Whatever it is they say they’ll give up, they won’t. And you won’t either. So, let’s use that liar budget as a starting point and really look at your expenses. Your rent, utilities, insurance and so forth are reasonably fixed, so at least that’s something that you can’t really influence too much. You could move to a smaller apartment or turn the heat down, but assuming you’re not going to do those things, you can basically assume these are fixed costs. Other costs, like dining out, buying new clothes, investing in hobbies or even sending your dog to day camp, are costs you have a lot more control over. This is where you can really make a difference in your budget. Remember, we’re saving over the long term, so nickels and dimes matter. When you write a budget that says you’re going to stop eating out with your friends on Saturday night and won’t buy another new shirt for six months in order to save, it’s pretty unrealistic to expect that you’ll be able to maintain that level of self-deprivation. Instead, do the things you do, but reduce your spending by 10 to 15 percent. Check out the clearance racks, order a slightly less expensive entree or one less drink. Ten percent is almost nothing. You can easily drop that little bit into your savings account and watch it add up, bit by bit. This is realistic budgeting. It’s budgeting for real people, not imaginary people in accounting textbooks. Increasingly, banks are figuring out that it’s easier to trick you into saving money than asking you to do it. They might take a dollar for every transaction you make with your debit card, for example, and drop it into your savings account. This doesn’t sound like it will amount to much, but think about how many times you use your debit card over the course of a month. That really adds up. Other accounts, like investment apps Stash and Acorns, can be configured to take small amounts of money from your checking accounts when they’re at high tide and leave that money alone when you’re just barely scraping by. Investment accounts carry some risk, so that money isn’t as secure as what would be if it were squirreled away by your bank, but you can always sweep it into your true savings account from time to time. It’s easy to get ahead of yourself when it comes to little subscriptions. Oh, Netflix is only $13.99, Hulu’s $6.99, Audible is $15… and on and on. Since they come out automatically, you hardly give them a second thought, the money just magically dissolves. This is a huge source of economic hemorrhage and a great place to start looking for money you could be saving. If you made a budget like we talked about in Tip 1, you know how many subscriptions and memberships you have. How many of those do you really use? If you only log into Hulu for one show that’s been discontinued, finish it up, then unsubscribe. Start dropping that seven dollars into your savings account instead. You only pop into the gym when it’s below freezing? Cancel that and toss the money toward your future — you can put a home gym in your new house if you save well enough. It’s amazing how many subscriptions we hold on to out of habit, or simply because we don’t think to cancel them. Beyond being a handy way of figuring out where they hide the bars of Irish Spring, downloading the apps for frequently visited retailers often gives you access to their digital coupons. These things are great! They’re simple, too. All you have to do is scroll through a list of coupons and load them to your membership card or scan items as you go through the store and build up a list of coupons that are applicable, then show the QR code the app generates to the cashier for your discount. Either way, if you use digital coupons to help plan your shopping, you’ll not only be able to skinny up that grocery budget, you may glean additional benefits like gasoline savings from the same retailer. Go ahead and deposit the coupon savings in your future home account and subtract the whole bill before discount from your budget to make the books balance. This is suggested with a caveat. If you’re very close to closing, don’t do anything that might touch your credit. This is only for people who aren’t ready to talk to a loan officer and are looking for dollars and cents to put together for one of these days. Whether you’ve got a car loan with a high interest rate or a student loan that was never consolidated, you may want to consider refinancing some of your debt. Look for lower rates and longer terms to get smaller payments, but don’t sign on the dotted line unless everything is just right. And remember, simply because your new car payment is $200 doesn’t mean you can’t pay $300 once you’ve closed on your new home (unless there’s a prepayment penalty, in which case, just say no!). Being able to drop that extra money into savings now means you can move toward your home buying goal more quickly and your bank will view you as a smaller risk because your debt to income ratio will be smaller. Refinancing can be a sort of double-whammy when done correctly. Just realize you may end up paying more in the long term because of additional fees and interest along the way. I know you really wanted that extra breathing room now that you’ve paid off your Target card, but instead of spending that freed-up money every month, why not pay your savings account instead? You’re already used to making the payment, so your budget won’t change, and you’ve managed to make it every month so far, so you know you can do it. It’s not forever, it’s just until you buy your new home. And, hey, if you have a surplus, you can go on a mad shopping spree at IKEA. Just make sure you wait until after closing. Surprise expenses can appear at the last minute and you don’t want to be caught with your arms full of Swedish meatballs. 7. What Do You Spend Maintaining Your Stuff? Does your stuff need its own budget? Think about this long and hard before you answer. Lots of hobbies and belongings require considerable upkeep. If you’re not really using them anymore or you’re not really enjoying them like you used to, it may be time to part ways. Sure, you thought having a giant aquarium would be fun, but all the food and filters and equipment adds up. By eliminating that aquarium you don’t really enjoy, you could be saving yourself in two ways. First, you can divert the money you used to spend on your fish into your house savings account, and second, you don’t have to figure out how to move that giant thing into your new house (it can be quite the undertaking). The same would apply to anything that needs regular care and feeding, like a project car that has to be insured or a motorcycle you don’t ride anymore because you just don’t have time. Turn those old hobbies into cash by selling them off, then funnel the money you used to pay toward them into your savings account. 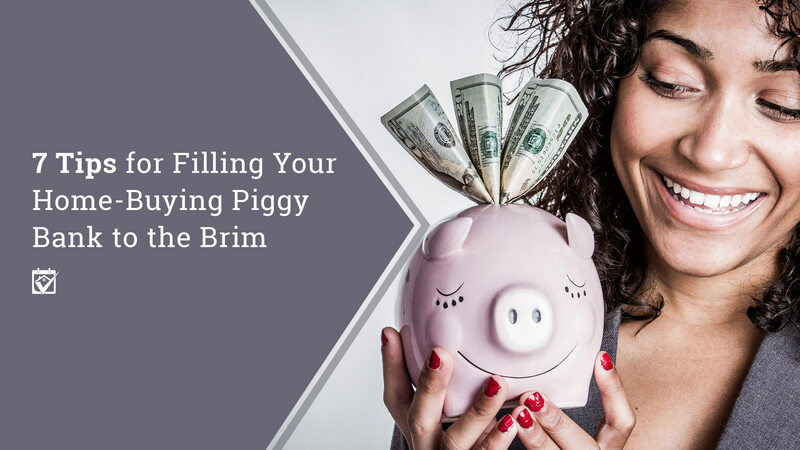 If you use any or all of these tricks to stuff your piggy, you’re going to have an easy time saving money all over the place. That house will be yours in absolutely no time. Then, when you’re ready to make loan application, check out the recommended loan pros in HomeKeepr. They’ll help you get your documents together and find a mortgage that fits your budget and needs perfectly. Because they’ve already been recommended by your Realtor, you know you can depend on HomeKeepr’s loan pros to get you all the way to closing smoothly.